Healthy Children > Healthy Living > Nutrition > What About Fat and Cholesterol? Many Americans consume too many calories and too much fat, especially saturated fat,trans fat, and sugar. These eating patterns are one cause of America's high rates of obesity and heart disease. As a parent or caregiver, you can help your child develop healthy habits that can last a lifetime. Although many things influence children, adults are still the most important role models. The single-best predictor of a child with a healthy weight and lifestyle is parents who set a good example by making healthy food choices and engaging in regular physical activity. If heart disease runs in your family, your child is at greater risk for heart disease in adulthood, making this even more important. Read on for information from the American Academy of Pediatrics about fat in food and healthier food choices. 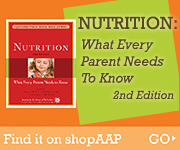 If you have specific questions about your child's nutrition, talk with your child's doctor or a registered dietitian. Fat in Food: How Much for Children? Childhood is the best time to start heart-healthy eating habits. But eating healthy for most children doesn't mean following adult goals for cutting back on total fat, saturated fat, trans fat, and cholesterol, particularly for children younger than 2 years. Fat is an essential nutrient that supplies the energy, or calories, children need for growth and active play and should not be severely restricted. However, if your child is younger than 2 years and overweight or at risk for overweight, or has a family history of high cholesterol or heart disease, reduced saturated fat dietary choices may be appropriate. Check with your child's doctor or a registered dietitian before restricting fat in your child's diet. Between the ages of 2 and 5 years, encourage children to gradually choose foods with less fat, saturated fat, and trans fat. By age 5, their overall food choices, like yours, should include heart-healthy foods such as low-fat dairy products, skinless chicken, fish, lean red meats, whole grains, fruits, and vegetables. NOTE: Restricting a child's eating too much may harm growth and development or encourage undesirable eating behaviors. Before making any drastic changes in a child's eating plan or physical activity habits, talk with your child's doctor or a registered dietitian. If your child is younger than 2 years and obese or overweight, consult your child's doctor before restricting fat or calories, such as with reduced-fat milk. How is Saturated Fat Different Than Other Fat? Saturated fat is usually solid at room temperature, compared with liquid fats like oil that contain unsaturated fats. Saturated fats come mostly from animal sources, such as butter, cheese, bacon, and meat, as well as stick margarine. Polyunsaturated and monounsaturated fats are found in vegetables and fruits (for example, olives, soy beans, nuts). Trans fats are fats that begin as good fats but are chemically changed to keep foods fresh for longer; unfortunately, they can be bad for your cholesterol levels. They are found in baked goods and processed foods. Reading nutrition information labels and ingredients to look for saturated and trans fats can help you determine how much of these fats are present in a particular food. Cholesterol—Where Does it Come From? Cholesterol is made by your body to help form the walls of cells and organs. It is an important part of the brain and nervous system. The liver converts fat that you eat into cholesterol. Cholesterol also comes from your diet; it is found in large amounts in shrimp, octopus (calamari), and organ meats such as liver. Eggs also contain cholesterol in lesser amounts. Have plenty of fresh fruits and vegetables available and ready to eat. Washing and preparing these ahead of time may make it more likely your family will eat them. Select lean meats such as skinless chicken and turkey, fish, lean beef cuts (round, sirloin, chuck, loin, lean ground beef—no more than 15% fat content), and lean pork cuts (tenderloin, chops, ham). Buy "choice" or "select" grades of beef rather than "prime." Trim off all visible fat. Remove skin from cooked poultry before eating. Include healthy oils such as canola or olive oil in your diet. Choose margarine and vegetable oils without trans fats made from canola, corn, sunflower, soybean, or olive oils. Choose tub and liquid margarine rather than stick margarine, which contains trans fats. It's important for children and adults to be sensible and enjoy all foods but not to overdo it on one type of food. Also, no food should be forced or forbidden. When children think a food is forbidden by their parents, it often becomes more desirable. However, children should know that sweets and higher-fat snack foods in appropriate portions are OK once in a while. Active Play is Important Too! Physical activity, along with proper nutrition, promotes lifelong health. Active play is the best exercise for kids! Parents can join their children and have fun while being active too. Some fun activities for parents and kids to do together include playing on swings, riding tricycles or bicycles, jumping rope, flying a kite, making a snowman, swimming, or dancing. The daily recommendation for exercise for children (adults also) is at least 1 hour per day. This takes commitment from parents, but the rewards are time together and better health. Developed in collaboration with the Academy of Nutrition and Dietetics (formerly American Dietetic Association).